What Does David Ramirez Know About Failure? The director of psychological services once flunked orgo. For the past 16 years, the campus community has benefitted from the presence of David Ramirez, director of counseling and psychological services (CAPS). Overseeing a staff that provides counseling and therapy for all students on campus, he says that by graduation, typically about 36 percent of each graduating class will, at some point, have sought help from CAPS. They come from all classes, majors, and levels of academic performance. The most common reasons for student visits, he says, include anxiety, depression, interpersonal conflicts with peers or family members, substance abuse, and despair including thoughts of suicide. Ramirez’s path to Swarthmore was not straightforward. When he entered San Antonio College out of high school, he aspired to be an engineer—until, as a sophomore, he flunked organic chemistry. Most of his classmates were equally unsuccessful. A talk with his instructor, who assured him that typically most students fail the first time around, led Ramirez to question the usefulness of a course designed for failure and left him disenchanted. But that same semester, he’d enrolled in a social psychology course, in which he says he had the time of his life. What’s more, he aced it. The budding engineer became a psychologist. After graduating with a B.A. in psychology, he spent six years first as a counselor and later director of a therapeutic camp for children, based on the Outward Bound outdoor education program. Ramirez says that taking troubled kids on four-week camping trips in the Texan wilderness, where he provided therapy while teaching them camping skills, led him to realize that he wanted to be a psychotherapist and that he was well-suited for it. A doctoral program in counseling psychology at the University of Texas included an internship in the Psychiatry Department at Temple University’s School of Medicine. Although simultaneously working part time at UPenn’s counseling service, Ramirez had no plans for a career in a college mental health environment—until Haverford College recruited him as a counselor. In 1994, he came to Swarthmore. 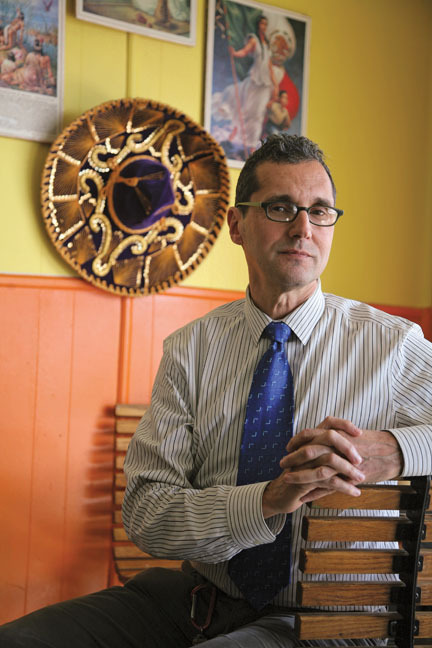 These days, when students seek help from Ramirez about fear of exams or failure, he’s able to comfort them with the firsthand knowledge that failing is hard but that it sometimes leads to unexpected and positive results. What are some keys for success in helping students through their problems? One prerequisite for clinical practice is the ability to tolerate people’s distress and not be put off by it, to try to understand what the person is experiencing and help discover what they need to resolve the pain. Is there a limit on the number of therapy sessions a student may have? No. Other colleges differ in this respect. Having no session limit strengthens the safety net for the student population. Do you provide services for other members of the campus community? We provide direct clinical counseling and therapy only to students, but we offer consultation services to faculty, staff, and parents. I do a lot of consultations, and we can make referrals to other providers if necessary. Many faculty and staff members have children at different colleges, and I receive a good number of calls for advice about what their kids are experiencing. Along with the successful treatment of our own students, training interns is phenomenal. CAPS is like a teaching hospital. We have a great group of doctoral interns here, whose training I oversee. They’re passionate, dedicated, and smart practitioners. 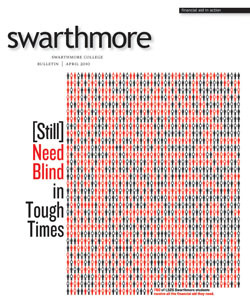 And Swarthmore is a very desirable placement, so we can be really selective. I dedicate a good amount of time to my family—my wife Mary, my 18-year-old daughter Martha, and my 15-year-old son Xavier. I also love cycling, yoga, reading, and hanging out at Starbucks. I’m very social. Do your children come to you for counseling? Not really, although they’re both pretty psychologically minded. My son took a careers aptitude test at school, and apparently he’d make a good clinical psychologist. Currently, though, he’s more interested in video games and roller hockey. I’d like to ride my bicycle through Big Bend National Park, Texas, and have a personal masseuse and chef at the end of each day. I’d like my wife to be there, too—and my kids. I’m sure my wife would be interested. If you could be a different person for a day, who would you like to be? Terry Gross [the host and producer of NPR’s Fresh Air], because she’s such a skilled interviewer, meets so many interesting people, and seems to have so much fun doing it. She covers such a broad range of topics and is always so well-prepared. I really admire her. What’s your prescription for a well-adjusted life? To be well-educated emotionally; develop tolerance and appreciation for a wide range of emotional states; cultivate an interest in the experience of other people; appreciate what one has; and to be kind. Do you see yourself that way? I work at it. And I work at teaching it. If you need counseling, to whom do you turn? To my colleagues. We work on a collaborative model. If it’s personal, I seek out my friends. Having missed something important that my children might need. I fear botching parenting. It’s the thing I care most about in terms of other people relying on me. How about your favorite food? Mexican. A fajitas platter, with flan for dessert. What has influenced you personally and professionally? My Mexican American heritage informs my sensibilities about what’s important in life. I learned in the context of the broader familial experience to be kind, tolerant, grateful, enjoy life, people, dancing…. A second thing is the impact of my training as a psychoanalyst, which included my personal analysis. Third, living in the wilderness in my first job for weeks at a time over a period of seven years. These have all shaped my philosophy of life and my professional practice. I so enjoyed reading David's interview. I especially like his comment about tolerating or 'being with ' the student and what they are feeling - to not be 'put-off' by it when they share their pain. So many of the children who come for therapy after being in a therapeutic process say to their parents 'don't try and fix it'. In other words the well meaning response is to 'do something' however, so much of what the child or college student is looking for is the active listening and feeling of being understood. They are having trouble fathoming something and the adult who can fathom it provides hope. I liked David's mention of the wilderness too as being formative - and that the most awesome responsibility is parenting. Swarthmore Counseling services has been very fortunate to have David at the helm. I also enjoyed this interview. I found it when I did a search looking for more information on CAPS. My experience with the program in the past has been very positive. Many thanks to David and his team for the time and energy they put into making the program what it is.